Indoor kennels keep your pups warm and dry. Whether you actively compete in dog sports, wish to enter the pet-care industry or simply want a safe, secure spot for your furkids, designing a specialized indoor kennel carries a lot of perks. When you do the design work yourself, you're assured the end result is what you want. Brainstorm ideas for your kennels. Why are you building a kennel? What goals do you wish to achieve? What would your dream kennel look like? What's the biggest dog you'd have to house? How many dogs will you have to house at once? Spend 15 minutes jotting down phrases, ideas, wishes and concepts centering around your kennel. Don't worry about if it's feasible or how you'll implement an idea. Simply write down anything that comes to mind. Consider the location of your kennels. 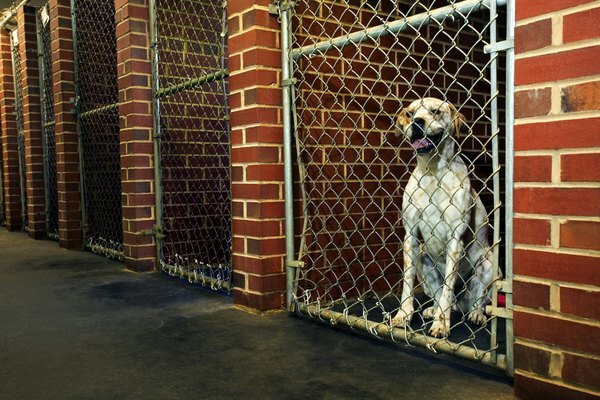 If you're running a business or operating a large-scale breeding or training operation, housing your kennels in a free-standing building allows optimum noise control and sanitation. On a smaller scale, though, having a couple of self-contained kennels in the basement can be very handy. Determine the amount of space you have to work with. View the location where you've decided to build the kennels and carefully measure the area. If necessary, recruit a friend to help you. Research amenities to include in your design. Sloped floors make clean-up a breeze, as does epoxy coating. Swivel bowls in the door of each run allows for efficiently at meal times. Consider adding a locker to the front of each run for the storage of a dog's personal or medical supplies and equipment. Glass kennel fronts add an upscale look and bright, splashy colors help make the kennel area welcoming. When it comes to the specifics of a design, your imagination and budget are the only limits. Plan the way the space will be used in the kennel. Will you need a laundry area, bathing area or food storage/prep room in addition to the kennel runs themselves? Look over your brainstorming list and gauge which suggestions are necessary, which would be really neat and which ideas simply aren't feasible. Once you've determined the number and types of areas you'll need in your kennel, you're ready to move to the actual design stage. Pencil the individual areas into the sketch of your proposed kennel. Add one at a time and carefully consider ease of use, accessibility and the "flow" of the areas. For instance, placing a food storage room and a food preparation room at opposite sides of a building doesn't make a lot of sense. Check areas off your list as you pencil them into the sketch and label them on the drawing. Figure out how much space each room needs within the building. Keep your total space available in mind while working and determine each room's ideal size. Juggle the numbers a bit until you arrive at sizes that not only seem like they'd work but that seem natural. For example, a 20-by-15-foot bathing area is rather large if you're simply needing a bath tub and a cabinet with some towels and brushes -- 8 by 4 feet might fit the needs of a bathing area a bit better. If necessary, use your tape measure to visually mark measurements so you can conceptualize them. Calculate the number of runs you can build within the allotted space for kennels. Current veterinary and humane society standards recommend runs large enough for a dog to take several steps forwards and backwards and be able to turn around without any part of the dog's body touching the sides of the run. By these guidelines, most runs for a medium- or large-sized dog should be at least 3 feet wide and 4 feet long at a bare minimum. Make the runs as large as possible while including the number of runs you need. Consider alternate ways of arranging runs so you'll have more space to work with. Perhaps instead of putting one row of runs against a back wall, you could build two rows of runs back-to-back in the center of the room with the gates facing the edges of the room. Double-stacking runs is an extremely quick way to double your capacity and useable space. Pencil your runs into the sketch you've been working on. Determine what, if any, sanitization equipment you will need installed. Will you need drainage systems in each run? Will you need a high-pressure hose and sprayer in the kennel area? Add necessary equipment to the sketch. Draw a small circle in the part of the run where drains would be installed and consider optimal placement for hoses or other sanitization systems so you'll have access to every run. Fill in the blanks left in the sketch. Pencil any necessary shelving units, counter space, cabinets or other equipment integral to the design of the kennel. Double check your measurements and make sure everything is working as planned. Make adjustments as needed. Sit your sketch aside for 24 to 48 hours once you've penciled everything into it. Don't look at it and allow your brain a chance to rest. After a suitable amount of time has passed, review the sketch again. Make any adjustments necessary. When you're satisfied with the final result, you're ready to move on to the next stage. Set a scale to be used in the final drawing of your kennel building. Common scales include 1 inch to 1 foot or one graph paper square to every half foot. Once you've set a scale you're comfortable with, grab some graph paper, a ruler and a pen. Label the graph paper in one of the upper corners with the date, the design name and your name. Place the scale in one of the lower corners. Take a deep breath and review the rough draft sketch you've been working on. Begin by drawing the outside boundary of the kennel building. Use your ruler to ensure your lines are straight and that you're keeping to your chosen scale. Draw one wall at a time and reference your sketch between each new addition. Add the internal areas of the kennel one room at a time. Use your ruler for every line and double check your measurements. Once the shell of your building is drawn and filled in, add the features of each room, such as cabinets, counters, bathtubs, integrated crate space, doors and windows. Carefully label each room and major feature. In a second document, write out the design specifications of each room, including information such as material choice, height of kennels, colors, special additions, and amenities. Keep in mind that you won't be the only person utilizing these documents and that your construction team, architect or other workers will draw information from them as well. Make sure your kennel design adheres to local ordinances and laws concerning placement, licensing and building codes. How Much Do Dog Walkers Get Paid?